To stay comfortable, there must be some moisture in the air, however excess moisture can cause problems. Moisture originates both inside and outside the home. The problems it creates can be controlled by minimizing the amount of moisture produced inside the home, minimizing the amount of moisture entering structural cavities like walls or attics, either from inside or outside of the home, and ventilating moisture producing areas such a kitchens, baths and laundries. Reducing the amount of moisture produced in the home is the first defense against moisture problems. This entails locating the major sources of moisture and where possible, decreasing their intensity. An average family of four produces 18 to 20 pints of moisture a day performing routine household activities. Just breathing produces between 8 and 12 pints in 24 hours, cooking adds another 5, showering another half pint per shower, and watering plants adds about the same amount of moisture to the air as is poured on the plants. Limiting non-essential moisture producing activities will reduce the amount of humidity in the home. If the home has humidifiers, they can be reduced in output or turned off, and the number of indoor plants can be reduced. Minimizing the amount of moisture entering structural cavities means separating them from both inside and outside moisture sources. 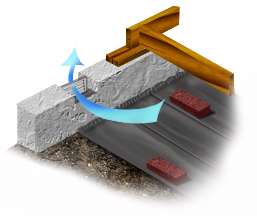 Vapor barriers should create a moisture tight seal around the home's interior. Bare earth floors of cellars or crawl spaces should be covered with a sheet of .4 mil or thicker polyethylene. Overlap the sheets and secure the them in place with a brick or sand. Basement floors and walls that get damp may need a waterproofing treatment. A dehumidifier may be used in these areas. Good attic and crawl space ventilation is essential to keep moisture from accumulating in these areas. Some well intentioned home owners seal attic and crawl space vents thinking they are reducing heat loss through these openings. While some heat loss may be prevented, considerable damage can result from the trapped moisture. In well insulated homes, there should not be much heat to be saved in these areas anyway. Ventilate moisture producing areas when moisture producing activities are performed. Kitchen and bathroom exhaust fans should be run during cooking or showering, and exhaust vents, including those for clothes dryers, should be vented outdoors and not into attics or other unconditioned areas.